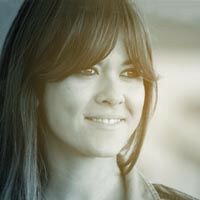 Vanesa Martín (Archidona, Malaga, 14 November 1980) is a Spanish singer and songwriter. She has shared the stage with artists such as Malú, Alejandro Sanz, India Martínez, Pablo Alborán, Sergio Dalma, David DeMaría, Chenoa and Diana Navarro. She has also written songs for singers such as Pastora Soler, Manuel Lombo, María Toledo and Siempre Así, among others. She already has six albums under her belt.